Das Kivotos Mykonos ist dieses griechische Inselparadies, von dem Sie träumen, wenn Sie Reisemagazine durchblättern – strahlend weiße Häuser, Hafenanlagen und Bettwäsche, die sich vom Blau des Ozeans und den schwarzen Felsen von Mykonos absetzen. Senden Sie eine Anfrage nach Verfügbarkeit mit Ihrem gewünschten Daten an die Kivotos Mykonos. Features a spacious bedroom area with 1 Queen size bed, a living room with a couch, one or two bathrooms featuring a bathtub and shower or just a large shower and furnished balconies with partial sea views and garden views. 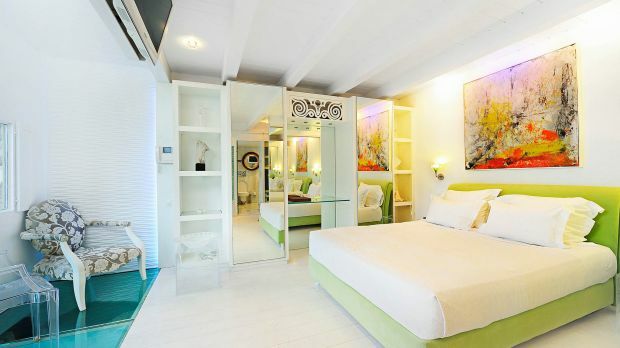 These are our One-of-a-kind One Bedroom Suites with Sea View. This means that each Suite is 100% individually decorated with a meticulous attention to detail. 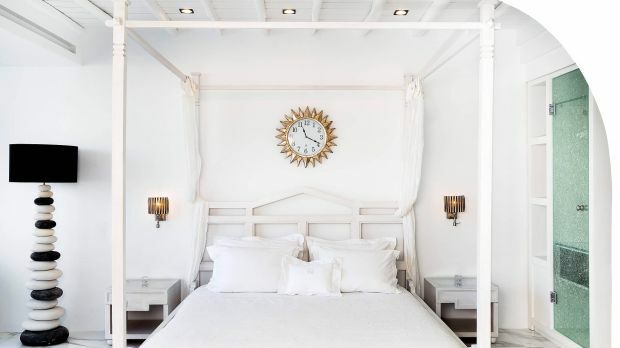 The architecture and spatial design of these Suites create a unique atmosphere, while their contemporary style with splashes of classic decoration, seductively allure the eye of the beholder. Soothing colors, high-tech appliances, and the awe-inspiring sea view will simply captivate your mind and soul. The size of these Suites ranges from 40 up to 70 square meters and they feature a Queen or King bedroom, a separate spacious sitting area, a bathroom with Jacuzzi or Bathtub and/or shower, and a veranda or balcony with outdoor furniture and amazing Sea Views. 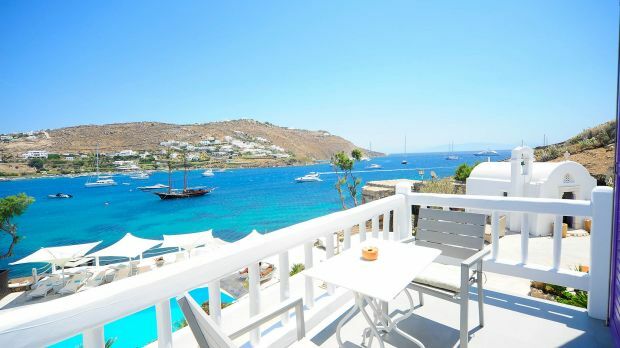 The Signature Suites Sea View are fully equipped with LCD televisions featuring satellite channels, autonomous air conditioning units, docking stations, fully stocked mini bars with premium brands, complimentary Wi-Fi and luxury toiletries. Fresh fruits and flowers are delivered daily, while turndown service is also provided in addition to daily cleaning and changing of towels and linens. The Junior Suites are dashingly stylish and spacious. 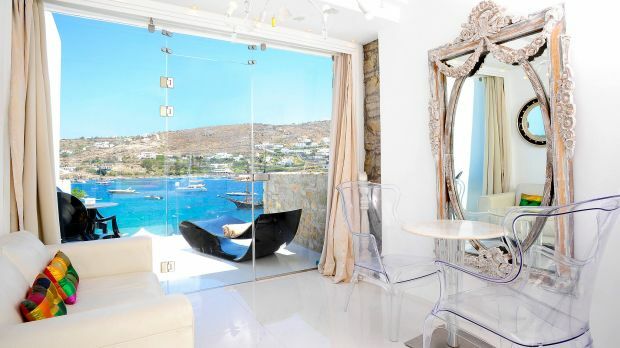 They feature a bedroom with 1 Queen bed, a sitting area with a couch, a bathroom with a bathtub or shower and a furnished balcony with direct sea views. Features 1 King or Queen bed, spacious sitting area, bathroom jacuzzi or bathtub and/or shower. Features soothing colors, high-tech appliances, sea view, 1 King bedroom, a large sitting area, a bathroom with Jacuzzi and shower and a private pool with a large outdoor lounge. This suite is fully equipped with an LCD television, autonomous air conditioning, a docking station, a fully stocked mini bar with premium brands, complimentary Wi-Fi Internet and luxury toiletries. Fresh fruits and flowers are delivered daily, while turndown service is also provided in addition to daily cleaning and changing of towels and linens. Features 1 King bed, 2 bathrooms, private glass pool and sea view. Features 2 King beds, bathroom with tub and shower and a balcony with sea view. This two bedroom suite with private pool is truly spectacular. 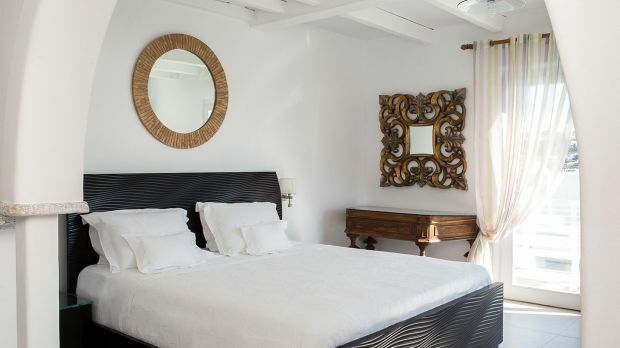 It features two bedrooms, one with 1 King size bed and the other with 2 Twin beds, two bathrooms with a bathtub and shower and a crystal clear private pool for unique moments of relaxation under the Mediterranean sun. Two Bedroom Villa located right above sea level, so close you can hear the water, with an Infinity Private Pool and direct access to the hotel's private beach. 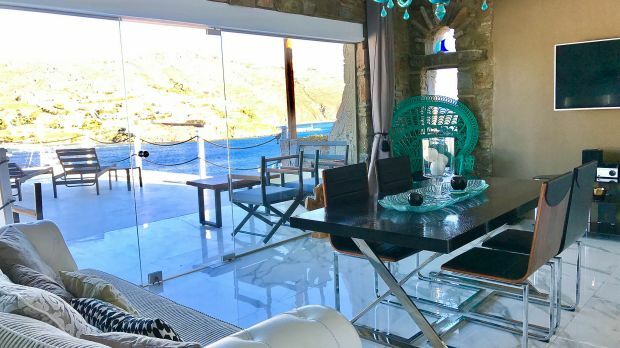 This unique Villa will remind you of the uniqueness of Santorini Island as its build in the earth with a large glass window in front, overlooking the Sea. Consisting of 2 Bedrooms (one master), a large living area, a walk-in closet, en-suite shower room and an outside lounge/sunbathing area of great size. Consisting of 3 adjoining Suites, in two levels, with an ample living area and a private exterior deck with a private pool. Ideal for families. This magnificent 150 square meter private waterfront villa is ingeniously blended into the natural surroundings, and boasts awe-inspiring architecture and spellbinding interior design. 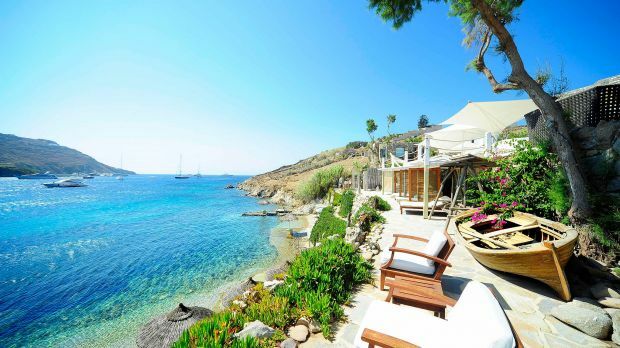 There is nothing short of magical about this villa, which has its own private pool and private beach area right in front, complete with sunbeds and umbrellas. The building is split into three levels. The ground floor has a lounge, a sauna and a bathroom with shower. The private pool starts from the outside and ends up inside the villa. The first floor features the master bedroom, a balcony, and a bathroom with a Jacuzzi and a window that overlooks the bay of Ornos. The second floor is ideal for romantic candlelight dinners and small intimate gatherings, since it comes with a bar and a long antique table. This floor also has a fully equipped kitchen -used by the villa's staff- and a bathroom with shower. The villa has an elevator -no interior staircase-, ultra-modern furniture and lightings, imaginative glass floors, and soothing colors in the shades of blue and lime green. It has 3 different entrances -one for each floor- and private access to the hotel's spa. Not suitable for children under the age of 12.